“Some people — some companies and decision-makers in particular — have known exactly what priceless values they are sacrificing to continue making unimaginable amounts of money,” Thunberg said. She then made an appeal to World Economic Forum attendees: "I ask you to stand on the right side of history. I ask you to pledge to do everything in your power to push your own business or government in line with a 1.5C world." "We want the government to take action and create a cleaner world. 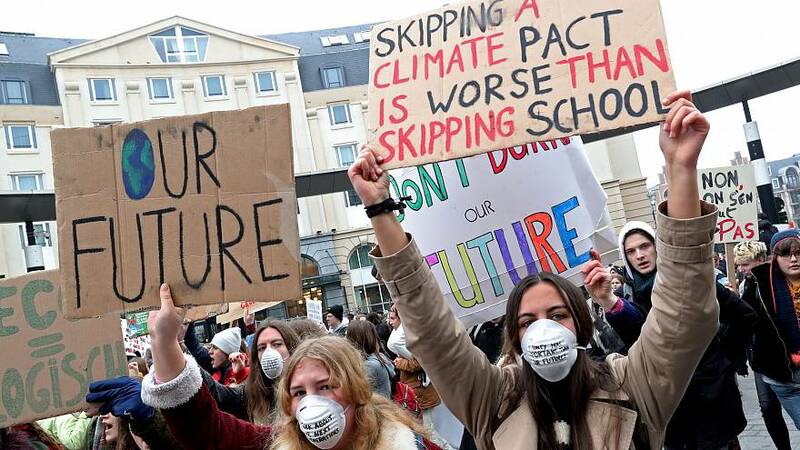 We're showing the big politicians in Belgium that we're afraid for our future and that we're going to have to deal with all the problems climate change brings along", a young Belgian student called Oona told Euronews after taking part in the Brussels march. "It's not about paying for our plastic bags or changing our toothbrushes to wooden ones: we need them to realize that the world is falling apart and there won't be anything left if we keep producing, eating meat, cutting down trees, driving cars at this speed", Oona added. "We have one message: clean the planet for the future!" Cody Corthouts, 19, told The Cube. Fleur, 17, who also marched through the streets of Brussels and past the European Parliament, was positive about the success that the event has had: "I'm really happy that the Belgian youth took the initiative on this matter." Some young protesters carried witty placards with slogans like "We're hotter than the climate" and "Change the system, not the climate". Others presented consequences of rising global temperatures: "Without Earth, there's going to be no more beer," one sign read.